Buckets, Dippers, and Lids is a well-constructed, inspirational self-help book for young readers. 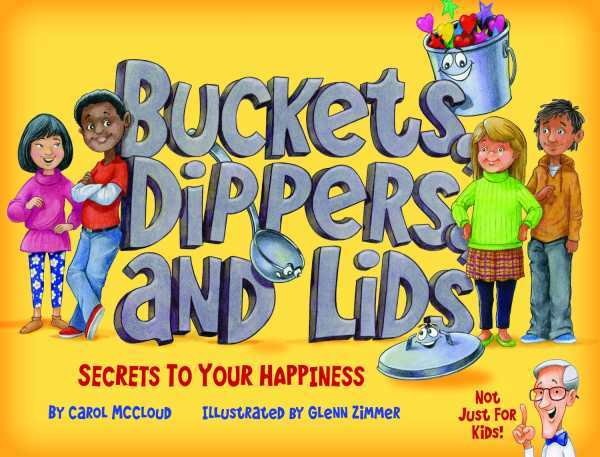 Carol McCloud offers practical tools and tips for happiness in her book Buckets, Dippers, and Lids. Taking a clever and abstract approach to self-help, the book uses imaginary buckets, dippers, and lids to represent the tools that are necessary to attain and maintain happiness. Here, happiness is stored in buckets, is depleted by dippers, and is protected from others by lids. The book opens with a scene in which a parent changes a baby’s diaper. Babies, it says, have to depend on other people to fill their buckets. But as children grow, the responsibility for filling their happiness buckets shifts to them. Characters age across the book, and the situations they face become progressively more challenging. They are shown learning to think of others first, dealing with name-calling and bullying sans retaliation, stopping and thinking before acting, and avoiding comparing themselves to others. The text explains each of the tools and how they are used early on in relation to such challenges. Three sections expand on each tool, forwarding thought-provoking questions, tips, encouragement, and reminders. The engaging, instructional text is also conversational and organized. Short, teachable statements are punctuated by questions related to challenging circumstances, including family issues like sibling rivalries and school issues like bullying. The unnamed cast is multiracial, multiethnic, gender-diverse, and religious. They are drawn in a cartoon style and are surrounded by personified buckets, dippers, and lids. The children are shown learning to use each tool as they are faced with challenging situations.